OGDENSBURG -- Tickets are on sale for "Christmas Wonderland: Holiday Spectacular" presented by Ogdensburg Command Performances on Monday, Dec. 3 at 7:45 p.m. at the OFA auditorium. 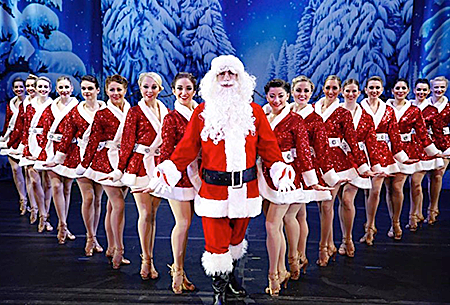 "Featuring glittering costumes, a dazzling cast, and the highest kicking Chorus Girls this side of the North Pole, 'Christmas Wonderland' features Santa, his merry helpers in a nostalgic Christmas performance," said the production company's website. Songs include "White Christmas," "Winter Wonderland," "Have Yourself a Merry Little Christmas," "Chestnuts Roasting," "Jingle Bells," "Away in a Manger," "O Come All Ye Faithful," "Let it Snow," "Silent Night," "Hark the Herald Angels Sing," "Deck The Halls," "Rockin’ Around the Christmas Tree," "O Holy Night," and many more. Tickets cost $19-$43 and are available by calling 315-393-2625 or by visiting www.ilovetheatre.org.